Jimmy and Amanda started their holiday in Thailand with a visit to Bungsamran Lake in Bangkok. On arrival the anglers began fishing on the public platform and were soon Fishing for Catfish casting out large method feeders packed with groundbait suspended under sliding floats. It was not long before one of the floats suddenly disappeared and line began to be pulled from the reel. On winding into the unseen Mekong Catfish the rod was immediately bent over as the fish charged across the lake. A ten minute battle followed before the Mekong Catfish was ready for netting. 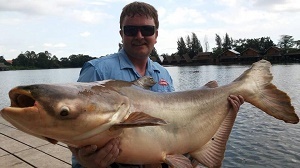 The Mekong Catfish was estimated to weigh 20kg’s and was released after photos. Further Mekong Catfish continued to slam into the baited feeders and Jimmy added several more Mekong and Striped Catfish between 10-25kg’s to his tally of fish. Another savage take saw Jimmy attached to a bigger sized Mekong Catfish which tore off into the central part of the lake. A twenty minute battle ensued which saw Jimmy piling as much pressure onto the fish as possible. After a few fraught moments at netting the Mekong Catfish was finally hoisted onto the mat. 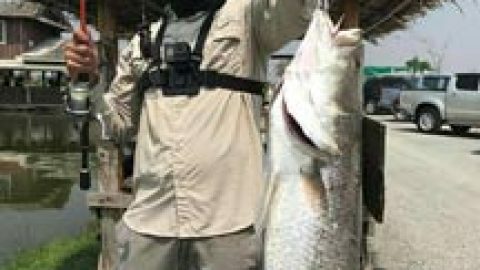 The Mekong Catfish was estimated to weigh 40kg’s and was proudly displayed by the captor.